Indeed all is not well. 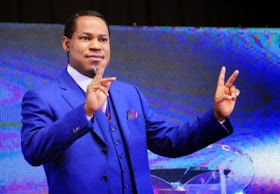 Pastor Christian Oyakhilome has finally addressed the allegations levelled against him after more than a week of maintaining silence on the divorce suit filed against him by his wife. I understand that some media houses particularly in Nigeria and maybe in South Africa (I dont know) but there are some of them that have been writing some real stupid things...real stupid things, an errrrhh...frivolous charges...that's crazy. 1. Moses for example, when he struck the rock twice, provoked by the anger of the people, not because he wanted to do something against the Lord. No Man of God does something against the Lord. Are you hearing me? No!...a Man of God is set on course, there is a type of life that he's been given, alright? 2. Then you have a young man, a young prophet, he wasnt named, he was deceived by another Man of God, and so he went in the direction God says don't go. That's only the kind of thing you'd find about a Man of God when he misses the message of God or he acts beyond what God said. But a Man of God setting himself in defiance to the word of God and living like they (media houses) are writing those stupiid things that I did this, that i did that...You don't know what a Man of God is..I don't go in that direction..that's crazy. I wasn't accused of those things you(media houses) said, nor did i commit those stupiid thing that you said...and i don't need to go to that level and such discussions. Jesus Christ was accused by many, with lots of frivolous charges. There would ALWAYS be those who'd like for it to be true, but you know, inspite of the accusations against Jesus, it didnt change who he was! There are preachers and there are Men of God. I'm not a preacher, I'm a Man of God...understand the difference. And I go in the way I'm asked to go, it may cause some troubles with individuals, but that's not because I've done something wrong. And when it comes to Rev. Anita, what I'd say to you is pray for her, don't act like 'why why why is she....' . Married to a Man of God does not automatically make you Woman of God! You can make mistakes, but you know, people expects the wife of a Minister to definitely be at the level of the Minister, and so they ay be looked upon and the expectations maybe like that, but it's a positional thing! alright! So, they are little things, don't try to make something big out of them, and emmm.. we're journeying, doing the things that God's called us to do...Christians should not have a divorce, it shouldn't be, but you see, that doesn't mean a Christian may not take the step. They may do it, but that doesn't make it right. And we shouldn't take one another to court, but when it happens, not because we wanna go there, someone is taking us there. That's a problem, be wise, stay focused in the Word of God, and don't let those who want to feast on things like this including Christians. You know there are Christians who like things like this, they wanna make something big about it. You should only say those things that are from God, and become honorable in your speech, Alright! ...and judge nothing before the time...be wise, Glory to God.